DSIIDC Business Centre | DSIIDC - Delhi State Industrial And Infrastructure Development Corporation Ltd. 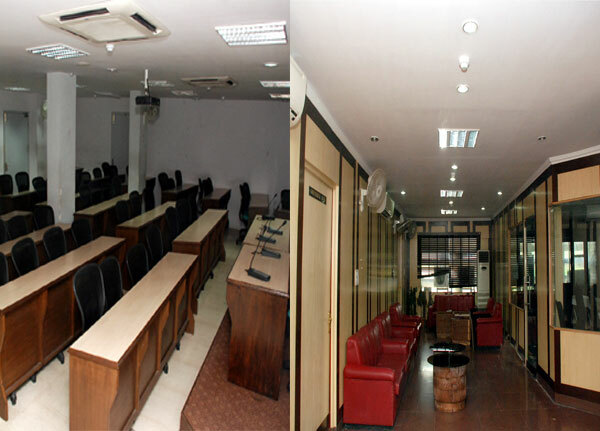 The Business centre of DSIIDC provides an ideal venue for conducting seminars, conferences, trainings and business meetings by government departments, banks, small-scale entrepreneurs, corporate houses and others in its highly spacious conference halls and board rooms. With its pleasing ambience,contemporary modern interior and rich decor the business centre is acclaimed by our valuable clients from across various sectors. Located in the heart of Delhi, the Business Centre includes fully furnished and appropriately constructed conference halls and board rooms which are perfect for holding meetings, conferences and seminars at the most reasonable rates. The conference halls are spacious and comfortably functional to accommodate 30 to 80 guests. The rooms have recently been renovated with up to date interior amenities, air conditioned make and 24 hrs power back up to ensure successful meetings and events. (Capacity: 80 persons) 9000.00 Full Day 10.00 A.M. - 6.00 P.M.
(Capacity: 80 persons) 6500.00 Half Day 9.45 A.M. - 1.45 P.M.
(Capacity: 30 persons) 6000.00 Full Day 10.00 A.M. - 6.00 P.M.
(Capacity: 30 persons) 4000.00 Half Day 9.45 A.M. - 1.45 P.M.
25% extra on all Holidays and in the evening from 6.00 P.M. to 9.00 P.M. Lunch & Dinner can be arranged on payment. GST @ 18% as applicable payment extra. Projector facility can be availed @ Rs.1000/- per day/per conference. Booking is done with advance Payment.